Conservation is at the heart of Norman Bird Sanctuary’s mission. We not only protect Mabel Norman’s Colonial farm property from development but actively steward the wildlife habitats in our care, to the highest standard. Our work to maximize plant and wildlife biodiversity, and improve the health of the local watershed. Conserving additional land parcels to expand from 235 to 325 acres, including acquisition of acres of beach, dune, rocky shore, salt marsh, and shrubland habitat at Third Beach. Restoring and maintaining 40 acres of grassland habitat. Including installation of 300+ nest boxes every spring. Restoring and maintaining 6 acres of New England cottontail specific habitat. Launching restoration of 2.5 acres of pollinator habitat. The project cuts out rampant invasives and replaces them with a pollinator-friendly mix of plants and flowers that will sustain crucial populations of birds, butterflies, bees, and other insects for the long-term. Constructing the Good Garden organic garden, for pollinators and educational programming. Constructing a rain garden and native pollinator plantings at the trailhead entryway. Developing an Invasive Species Management Plan, which outlines detailed plans for habitat restoration, trail improvements, and the removal of 11 primary invasive plant species from 150 sites on the property using only mechanical methods. No pesticides are used on the property for any reason. As the largest contiguous area of open land on Aquidneck Island containing thriving habitats of field, forest, pond, stream, and ridge, Norman Bird Sanctuary is proud to the home of diverse populations of native New England wildlife. 216 different species of birds have been reported over the years, including common year-round residents such as red-tailed hawks, mallards, northern cardinals, and downy woodpeckers and seasonal visitors such as tree swallows, great egrets, and many different species of warbler. But Norman Bird Sanctuary is not just a sanctuary for birds. 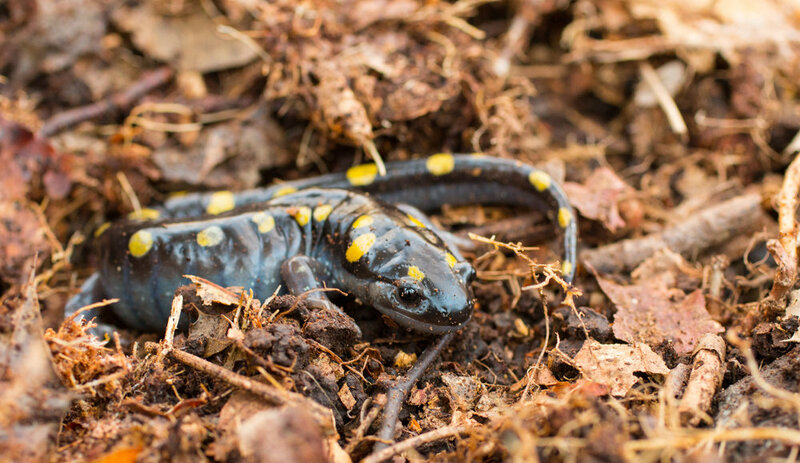 Common non-winged wildlife at the sanctuary includes mammals such as white-tailed deer, rabbits, coyotes, and minks; reptiles such as garter snakes and painted turtles; and amphibians such as spotted salamanders, gray tree frogs, and American bullfrogs.